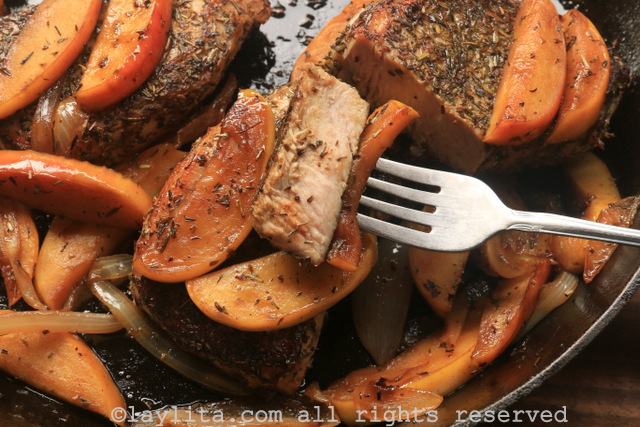 Enjoy this recipe for pan seared pork chops from my favorite French cook: my husband Nico. These seared pork chops a la provencale are made with pork chops seasoned with Herbes de Provence and seared in butter with caramelized cognac apples. In the South of France people like to grill meats. In the winter or colder months they are cooked in pans, while in the summer outdoor homemade grills are very common. It’s a common practice for people to go nearby forests and roadsides to pick up dry branches and use them as fuel for grilling food outdoors. Both olive oil and butter are used for cooking meat dishes, olive oil works great for grilling, but butter is a great option for searing meat. Using butter gives the dish a distinct flavor and creates a light coating on the taste buds that enhances the taste of the foods cooked with it. 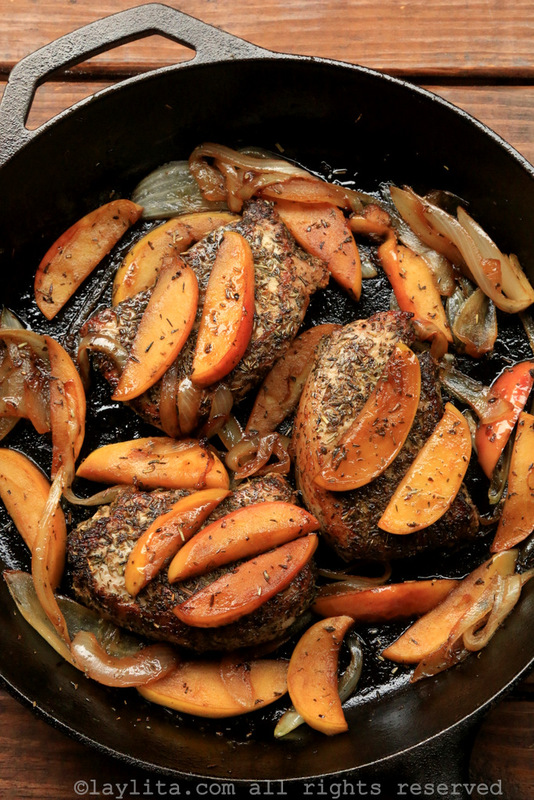 Pork chops seasoned with Herbes de Provence and seared in butter with caramelized cognac apples. 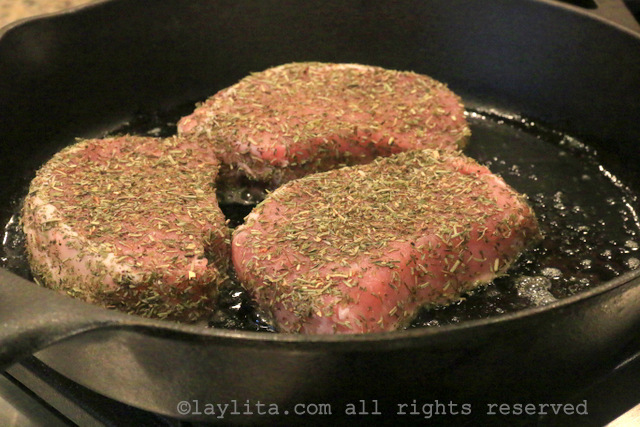 Rub the pork chops with the Herbes de Provence and salt. Melt the butter in a pan over medium to high heat. 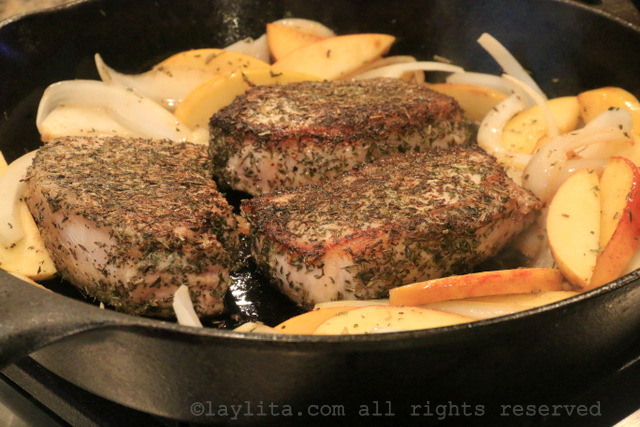 Place the pork chops in the center of the pan and let them sear until golden on each side. 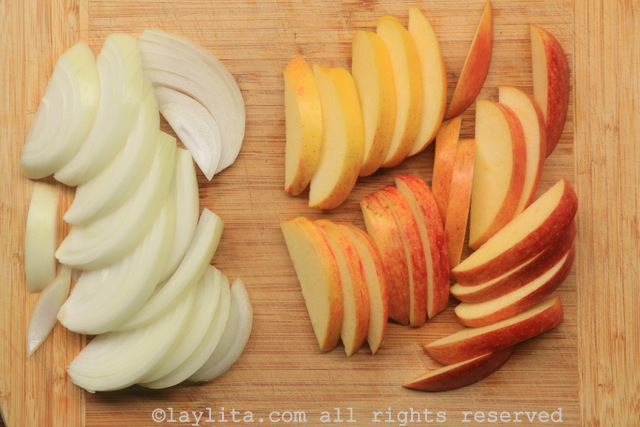 Add the sliced apples and onions. Continue cooking, stirring gently and turning the apples/onions as needed. 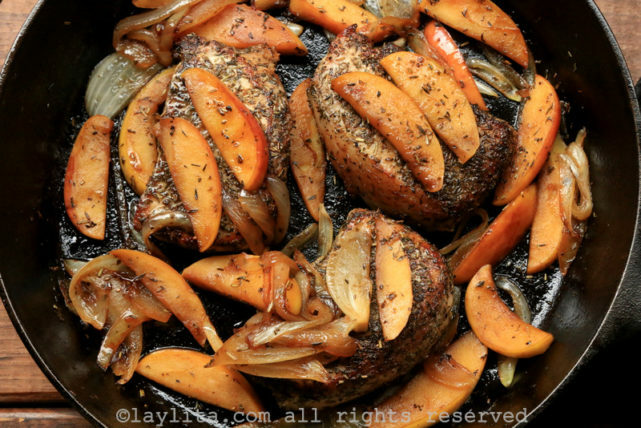 Once the pork chops are fully cooked remove them from the pan and place them on a warm plate. Add the remaining butter to the apples, next add the brown sugar and cognac. 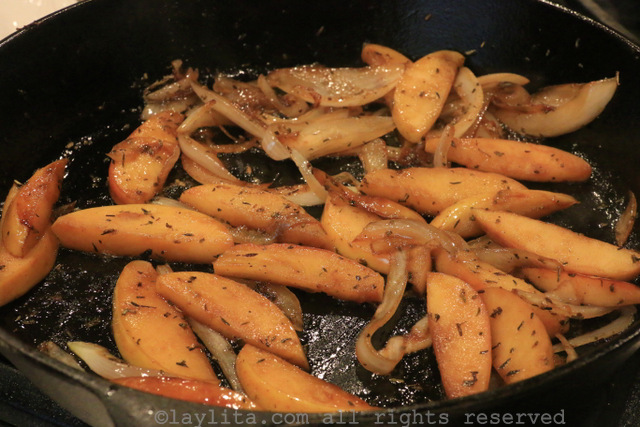 Gently stir the apples/onions and cook until the apples start to caramelize. 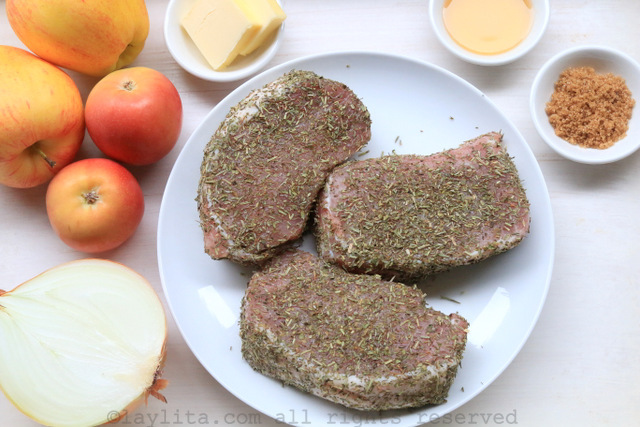 Add the pork chops back to the pan and serve immediately with your choice of side dishes. Thank you, I was happy to pair fresh apples with pork! This may be a silly question for experienced foodies….but what herbs are in “herbs de provence” ? I always seem to over cook it, maybe I need to use a meat thermometer…..? Hi Monica: herbes de Provence typically contain a mix of dry thyme, basil, fennel, lavender and savory. There are several variations in the ingredients for the mix and what quantity of each. Thyme is present in almost all. As for the cook time, I tend to cook them on high heat for just a few minutes on each side. Towards the end you can apply a flat fork and press out the blood left. It allows you to shorten the cook time, keep the chops moist and juicy while at the same time cooking them fully (no pink left inside). – Nico. Glad you posted the pictures. You didn’t say when to add the herbs. Also don’t the pork chops get cold in 10 minutes? Wouldn’t you want to put them in a covered casserole and slip into a warm oven? Or are they supposed to be eaten cold? Wonderful! Any secret for the meat. I am not sure why but everytime I cook pork chops the meet is not tender. I wonder if I overcooked? any tips. Mil gracias. Oh! This looks so delicious! @Laylita Oh this looks formidable! 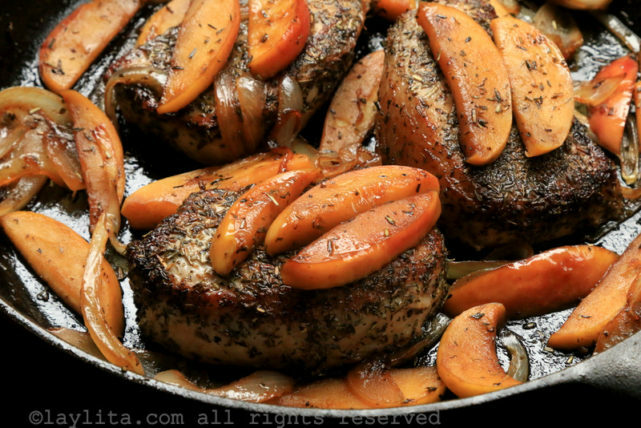 love the south french cuisine and I recommend this wonderful looking pork chops. How do the French stay slender? Would you have any tips perhaps? Hi Marina: not all French are slender :) From a food standpoint, a little bit of red wine is known for eliminating cholesterol (up to a point). There are many things that conventional medicine / diet hasn’t figured out. People in sunny areas like the South of France are generally thinner, sun exposure does something to body metabolism. People also walk frequently to get to work, take a lunch break at the nearby bistro, buy groceries, etc. Many small things. – Nico.